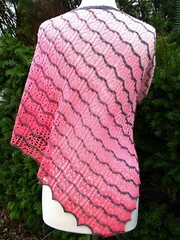 For the third year in a row, I was a happy member of Renee Leverington’s “Anniversary Mystery Shawl” group. The KAL began in May, but I made the project even bigger by doing four panels (instead of three) and adding beads throughout the shawl. The last few rows were taking me 1-2 hours each, but the finished project is 100% worth the effort! 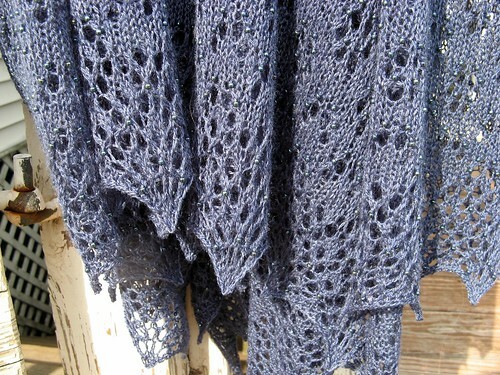 I love the weight of a beaded shawl, and the click-clack the beads make as the shawl swings. Yarn: Jaggerspun Zephyr Wool-Silk in Blueberry — my first time knitting from a cone! 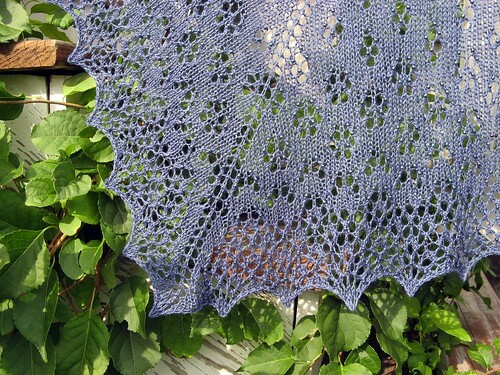 “Summer Rain” was another creative and flawless pattern, just as I’ve come to expect from Renee. The pattern called for three triangles, blocked into a half-hexagon. I decided I wanted more shoulder coverage and added a fourth panel and blocked it as a 2/3-hexagon. I also went a little crazy with beads! Near the top beading rows were few and far between, but I systematically increased the amount of beading until it was nearly every row on the final “clue” of this mystery shawl. Did you know that beads are hard to photograph? 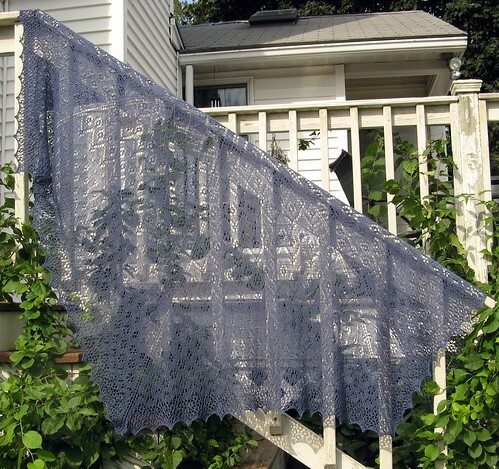 This year four members of my knitting group worked on the mystery shawl. 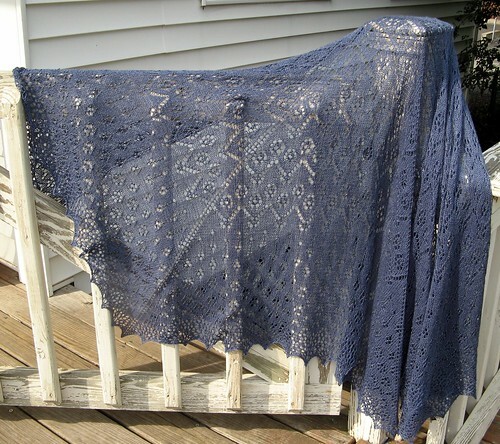 The first person to finish entered her shawl in a local ag fair and won 2nd place! I’m the second person to finish — two more to go! I was surprised by how nicely the Zephyr lace yarn stretched out while knitting. Silly me, I thought it “barely” needed blocking. 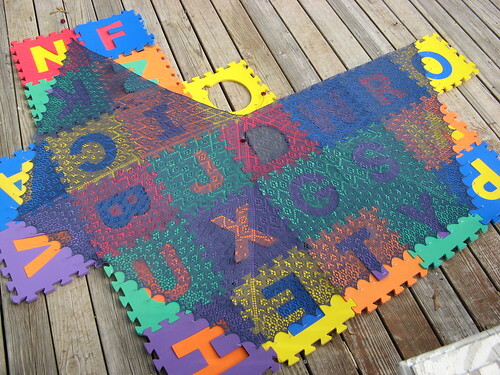 Here is a before shot — you can see how dense and crumpled it is compared to the blocked photos above. 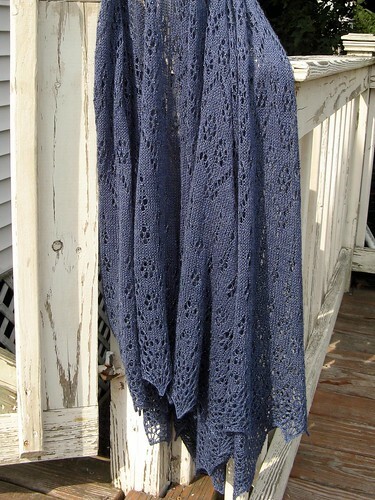 Here’s the pinned-out shawl! I used Knit Picks cables (from the interchangeable set) to block the top edges, and I pinned out points along the bottom edges. 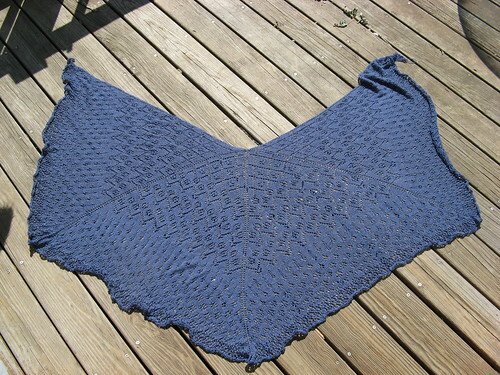 The shawl dried super fast — completely done in just one afternoon. Yarn is beautifull, pattern is beautifull, color is beautifull !! !